Feng Shui tips for room decorating are reflections of ancient Chinese science and art of creating harmonious and healthy home interiors that attract wealth and good luck. Candles are Feng Shui symbols of the Fire element that create warm and pleasant homes. According to ancient Chinese Feng Shui home decorating principles, candles help achieve a state of energetic balance with the environment. Feng Shui symbols of the Fire element bring the warmth of fire into interior decorating and Feng Shui homes for wealth that includes health, good luck and prosperity. Candles are beautiful room decorating accessories to Feng Shui homes. Candles invoke the energy of purification. Feng Shui symbols are inspirational and beautiful. Red, orange and yellow candles encourage meditation, help rest and release daily stress. Candles are best used in the central part of the house. South, Southwest and Northeast areas of your house are good for Feng Shui placement also. Natural candles help keep indoor air clean and healthy. Made with clean-burning wax and cotton wicks, scented with natural essential oils, these Feng Shui symbols are perfect for healthy room decorating. Fresh air and light scents for room decorating. As with all Feng Shui cures, not only the look, material and colors are important for creating the energetic balance. The energy of candles, candle holders and home accessories around candles help Feng Shui home for wealth. Place candles in the central part of your house. Red, orange and yellow candles symbolize the home hearth. Create simple and elegant, functional and clutter free room decorating. Less furniture and home accessories help Feng Shui homes, allowing the Chi energy, activated by candles, to circulate freely. Proper Feng Shui colors and candle holder material are important for room decorating to Feng Shui homes. Red, orange and yellow candles represent the Fire element. Candles in red, orange or yellow colors, combined with black, purple, blue and green candles represent all five Feng Shui elements, which are associated with the balance in personal, social and spiritual life. You can create floating candle centerpieces and beautiful candle arrangements with natural materials to increase the effect and Feng Shui home for wealth in different areas. Floating candle centerpieces, blue, green and black candles, placed in the North area of the house Feng Shui homes for career and livelihood, and in North-East for Understanding. Wood materials, candle holders, leaves, fruits, berries and wooden decorations, combined with candles in reddish brown colors, placed in the East, Feng Shui homes for family and health. South-East placement is good for money and prosperity. Red, orange and yellow candles in the South Feng Shui homes for fame and success. South-West placement is excellent for love. Metal candle holders, white candles, placed in in the West, Feng Shui homes for children and creativity, in North-West for friendship. Earth element can be represented by attractive candle centerpieces, made with rocks. Placed in the central part of the house, they Feng Shui homes for balance and peace. 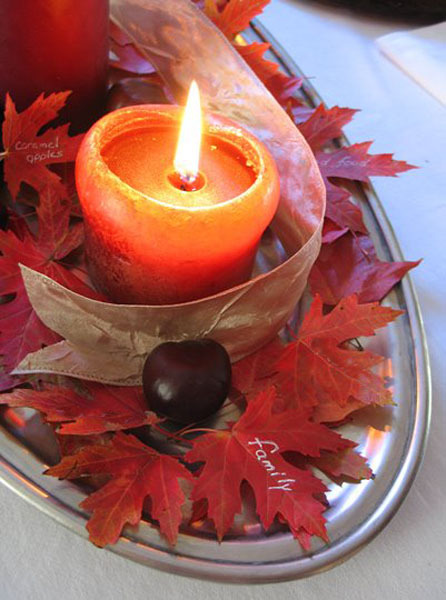 Fall leaves and candles centerpieces.